BE PART OF THE CHANGE! 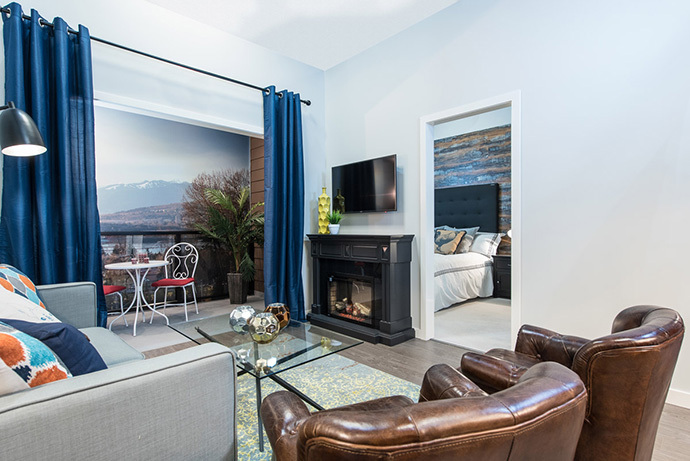 Brand new Surrey condos are coming to the new Venue Whalley urban flats development. One of the most intriguing features of this new Whalley Surrey real estate development is that ALL HOMES ARE PRICED UNDER $300,000! And even better, the new Venue Whalley condos start from an incredible price point in the mid $100’s! You can’t get any better value than this in the entire Lower Mainland. The Surrey Venue floor plans will range from studios to 1 bedroom suites and to larger 2 bedroom and den layouts! Your time is here and now! Seize it, embrace it, own it and love it! A home where you can live life on your terms. A neighbourhood that is rich in character, colour and history. Venue at Whalley’s corner, it’s where it all started. Your life, your way, your home. The project will feature a total of 141 urban flats in the heart of the next urban core in Surrey’s Whalley neighbourhood. On site will be a fully equipped gym, indoor social clubhouse style lounge and a 2,100 square foot roof top patio deck that will feature a BBQ, outdoor dining area, two gas fire pits with casual social seating, a multi-purpose area for lounging, hammocks and an entertainment kitchen with beer on tap! How great is that! The presentation centre for the new Venue Surrey condos will be situated at 114-10768 Whalley Boulevard, Surrey BC. They will be open noon to 5pm after the grand opening launch. The project is brought to you by Tien Sher Developers, a notable developer that has already transformed the Surrey Whalley neighbourhood with their Quattro projects. For more information about the new Whalley Venue Surrey condos, please visit www.venuelife.ca or you can register on this page for more details and to be represented and protected by a professional agent. The functional home layouts offer spacious, flexible and open floor plans for today’s urban homebuyer. As well, there are two professionally selected colour schemes for presale condo buyers to choose from. The main living areas will have laminate hardwood floors and there are polished chrome entry handles and nine foot ceiling heights throughout and eight foot in the bathrooms. The presale Whalley Venue condos will also feature energy efficient, double-glazed oversized windows and sliding glass doors in addition to large open air balconies. These new Surrey condos will also feature full seized energy efficient washer and dryer by Frigidaire. There’s also a spacious linen closet adjacent to the laundry room. Bathrooms at the presale Surrey Venue Whalley urban flats include floating vanities with durable quartz counters, contemporary wood grain laminate drawers, porcelain under mount sink, single lever polished chrome Grohe faucets and polished chrome hardware. The bathrooms will also feature glass mosaic tiled feature wall, porcelain tiled floors and bathtub surrounds in addition to water saving dual flush toilets. 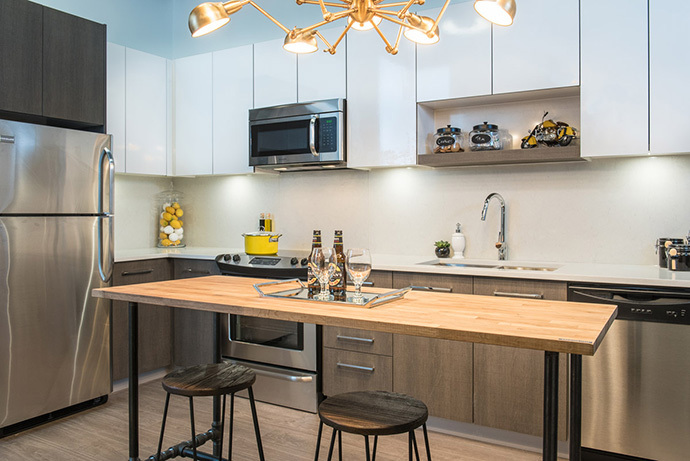 The modern kitchens will feature contemporary cabinetry with wood grain finish and chrome pulls in addition to sleek quartz counters and backsplash, double square bowl stainless steel sink, under cabinetry lighting and chrome Moen single lever faucet. The presale Whalley Venue apartments will also feature a Frigidaire stainless steel appliance package with Energy Star rating. The appliances included are an 18.2 cubic foot fridge/freezer, 30” slide in electric range with ceramic cooktop, dishwasher with front facing control panel, 1.6 cubic foot over the range microwave and an insinkerator waste disposal system. The kitchens also feature soft closing doors and drawers. All homes come with the Travelers Guarantee premium home ownership protection warranty. Residents at the Venue Whalley condos will enjoy a fully equipped fitness centre on site. As well, there is a relaxing outdoor space with a rooftop deck featuring BBQ outlets and beautifully landscaped sitting areas. The property will also have well-lit pedestrian walkways and common areas, rainscreen building envelope technology, engineered party wall construction between homes and secured double gated parkade with emergency alert buttons. As well, the Venue Surrey condos will have individually coded security key fobs and video surveillance entry system, hard wired smoke detectors in every home and individually keyed entrance locks. There is a secure underground parkade as well as bike/storage lockers for each suite. OUR TIME IS HERE: The Whalley Surrey real estate district has had its ups and downs, but like many historic Vancouver neighbourhoods that have been revitalized – YALETOWN, Chinatown, Main Street, Commercial Drive – its time has come. BE PART OF THE CHANGE: Early buyers in Vancouver’s revitalized communities saw their neighbourhoods grow into thriving, cultural hotspots where real estate prices rose with the areas’ desirability. For some, it was an investment. For others, it was a chance to have the authentic urban lifestyle they craved, in a home of their own, and in a neighbourhood they could help define. Now, it’s happening in Whalley real estate – and Venue Surrey condos is your chance to be part of the change. Just a 5-minute walk from the Gateway SkyTrain station, it has the perks you want (like a rooftop lounge with an outdoor TV and fireplace, plus a gym) with a future you can buy into. 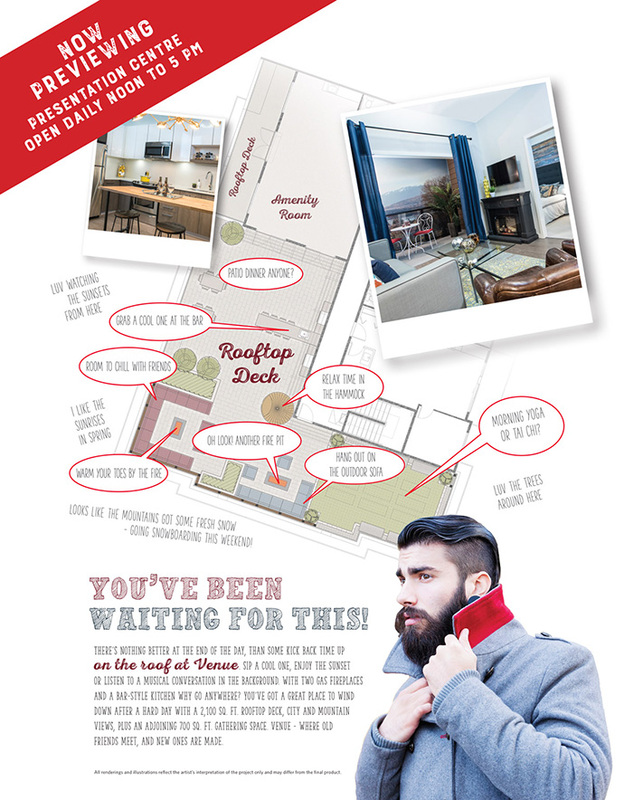 Venue Whalley urban flats – it’s the moment you’ve been waiting for.